France in London | Sarkozy Biopic, La Conquête, trailer unveiled ! Who gets your vote for the best performance as a policitian figure ? 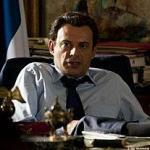 Sarkozy Biopic, La Conquête, trailer unveiled ! The trailer for The Conquest (La Conquête), Xavier Durringer's latest film relating Nicolas Sarkozy's rise to power in the five years before his election as President of France in 2007, has been unveiled. As such a film about a president still in office is unprecedented in France, The Conquest is one of the most anticipated film of the year. It is said to shed light on some of the mysteries of Nicolas Sarkozy's ascent to power : his stormy relationship with his predecessor, Jacques Chirac, and his divorce from his first wife, Cécilia (played by Florence Pernel), a former top model he married in 1996 and mother of his youngest son Louis, 13. The film will be released in France in May, and is said to be screened as part of this May's Cannes Film Festival, whose selection has not yet been announced. Respected stage actor Denis Podalydès (who played in Skirt Day, An ordinary execution and The Da Vinci Code) stars as Sarkozy and is, at first glance, quite convincing, despite the special wig he had to wear to imitate the cropped curly hair of the French President. You may also recognize Sarkozy's sworn ennemy Dominique de Villepin, played by Samuel Labarthe, and Jacques Chirac, played by Bernard Lecoq. Indeed, the film is crammed with political figures and should be an accurate depiction of the secret side of French politics. “In playing Sarkozy, the least I can do is not judge him and above all not caricature him. My role will be to make him human, give him depth, play on his contradictions,” says Podalydès. Admittedly, Podalydès's verbal mannerisms and the real 'Sarko quotes' he says prove that film-maker and director Xavier Durringer shows great insight into Nicolas Sarkozy's life. Indeed, renowned historian and documentary maker Patrick Rotman helped him by writing the screenplay. One of the most polemical point of the film is undoubtedly the undisclosed aspects of Nicolas Sarkozy's private life, from his split with Cécilia, who had an affair with American millionaire, Richard Attias, to his marriage with supermodel Carla Bruni and his allege romance with a young reporter. It will be very interesting to see if this film has any influence on French voters, as Mr Sarkozy is getting closer to the 2012 presidential elections with his popularity rating sinking to a record low. According to a recent opinion poll, almost 75% of French citizens believe Mr Sarkozy will lose next year’s presidential election. What do you think about Denis Podalydès starring as Nicolas Sarkozy ? Who gets your vote for the best performance as a policitian figure ?